Suria KLCC Group, the operator of 3 established shopping destinations - Suria KLCC, Alamanda Shopping Centre and Mesra Mall is committed to delivering a memorable retail experience where customers can shop, dine and be entertained. Suria KLCC, is Malaysia’s premier retail destination and provides a unique shopping experience with state-of-the-art amenities. Alamanda Shopping Centre, situated at Malaysia’s administrative capital of Putrajaya boasts a variety of shops, restaurants and entertainment facilities amidst lush greenery and landscaped walkways. Mesra Mall in Kemasik, Terengganu offers an array of specialty stores, sports and entertainment facilities. Apart from the three shopping centres, Suria KLCC also manages Anjung, a 3-storey retail complex located at Precinct 1 in Putrajaya. 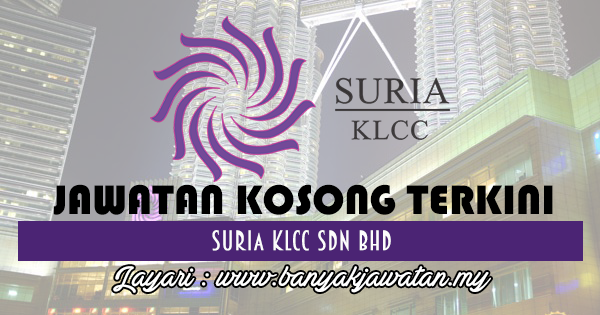 0 Response to "Jawatan Kosong di Suria KLCC Sdn Bhd - 24 February 2018"